One of the twelve minor prophetical books. It readily falls into two parts: (1) ch. i. and ii. ; (2) ch. iii. The first part is a "massa" (a condemnatory prophecy). But contrary to the usage in other prophetical books, it is not stated against what people the prophecy is spoken. As it now stands in the Masoretic text, the first part is in the form of a dialogue. Ch. i. 2-4 laments the prevailing moral corruption, which God does not seem to heed; i. 5-11 contains the divine announcement of an impending judgment through the Chaldeans; i. 12-17 gives the prophet's complaint of the excessive pride and cruelty of the enemy. In ch. ii. God admonishes Habakkuk not to judge hastily that evil is triumphant, but to remain confident (1-4). Five "wos," the contents of the "mashal" or "taunting proverb" (5-6), phrased by the very people oppressed by the conqueror, are enumerated (6, 9, 12, 13, 19). Ch. iii. is a psalm reciting various theophanies, describing God's warlike power, which bends earth, mountains, and rivers to His purposes—yea, even sun and moon, in behalf of His people. The song concludes with a declaration that though the blessings of nature shall fail in days of dearth, the singer will rejoice in the Lord (17-19). The book abounds in striking expressions and rare words, e.g., the description of the invasion of the Chaldeans (i. 6 et seq. ); of God as having "eyes too pure to behold evil" (i. 13); of "men as fishes of the sea" (i. 14); of the worship of the fisherman's implements (i. 16); of "the stone that crieth out" (ii. 11); of the folly of idolatry (ii. 18-19). Ch. iii. especially is rich in striking similes (14-15). The book is remarkable also for originality. The author departs from the usual method of the Prophets. In their addresses the nation is central; in Habakkuk's itis God and His government of the world. He attempts to unravel the meaning of God's tolerance of tyranny and wrong. In his questions Habakkuk voices doubts to God, though not against God (G. A. Smith, "The Twelve Prophets," ii. 130 et seq.). Ch. i. and ii., on the whole, are regarded as the work of one prophet. Still, the text as now presented has been found to contain certain difficulties. Taking i. 2-4 to be descriptive of Israel's moral corruption, critics have argued that this section could not have been part of a prophecy devoted to the setting forth of the wrongs under which Israel was suffering, a different sense thus attaching to the "wicked" and "righteous" in i. 4 and i. 13 respectively. Giesebrecht ("Beiträge zur Jesaiakritik," pp. 197 et seq.) and Wellhausen ("Kleine Propheten," in "Vorarbeiten und Skizzen") therefore consider i. 5-11 to be an older and independent prophecy written previous to the remainder of i. and ii. ; ch. i. 12 is regarded as the sequel to i. 4. The subject of the complaint in i. 2 is different from that in ii. 1. Kirkpatrick ("Doctrine of the Prophets," p. 268) holds the book as a whole to be the fruit of religious reflection, giving conclusions reached only "after a prolonged mental struggle." That i. 5-6, where the power of the Chaldeans is represented as still of the future, and i. 13-16, ii. 10, 17 disagree, though their descriptions of foreign nations appear to be based on actual observation, is another difficulty raised by critical scholars. Budde (in "Studien und Kritiken," 1893, pp. 383 et seq. ), reverting to a certain extent to Kuenen's disinclination to assume an earlier and a later section (see Kuenen, "Historisch-Critisch Onderzoek," ii. 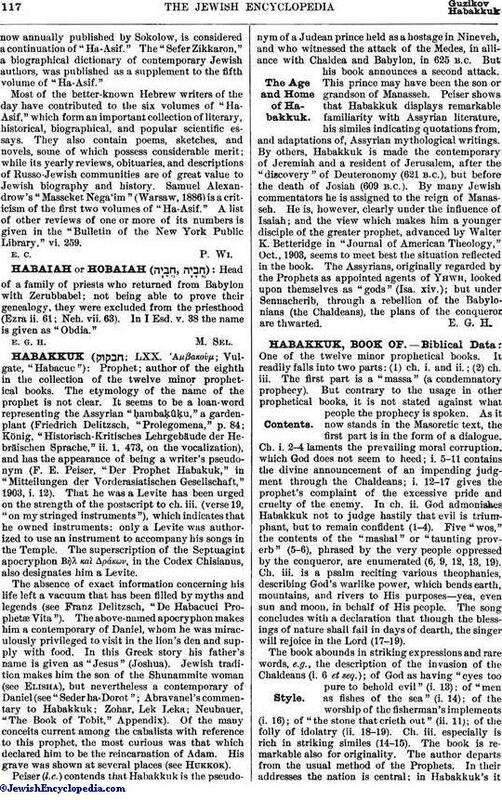 386 et seq., Leyden, 1889), showed that Habakkuk had in mind two world-powers: an oppressor (i. 2-4), and the Chaldeans, appointed to punish him (i. 5 et seq.). But this necessitates the placing of i. 5-11 after ii. 4. The oppressor to be destroyed is Assyria, and the Chaldeans are the implement of God's judgment. It is of the Assyrian's pride that the prophet speaks, not of the Chaldeans' presumptuousness. Ch. iii. is a psalm, not free from mythological elements and not by Habakkuk. 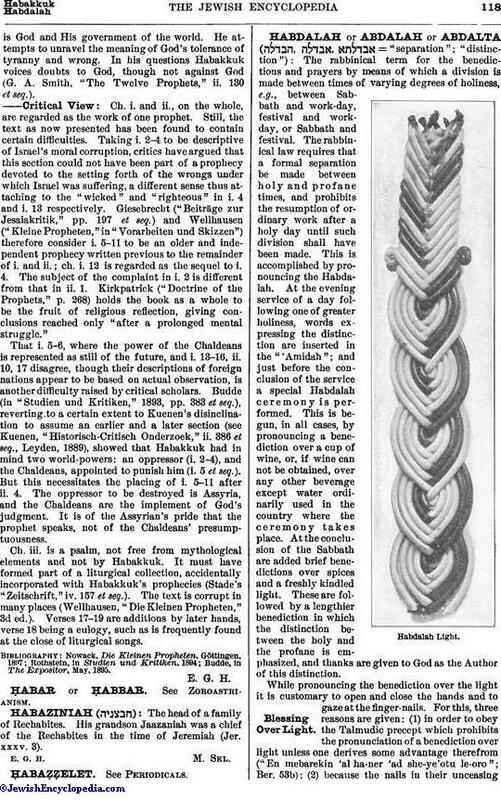 It must have formed part of a liturgical collection, accidentally incorporated with Habakkuk's prophecies (Stade's "Zeitschrift," iv. 157 et seq.). The text is corrupt in many places (Wellhausen, "Die Kleinen Propheten," 3d ed.). Verses 17-19 are additions by later hands, verse 18 being a eulogy, such as is frequently found at the close of liturgical songs. Budde, in The Expositor, May, 1895.